In a large saucepan over medium heat, saute the onions in the oil until they are golden brown. Add the lentils and butternut squash, then cover with about 6 to 7 cups of water. Bring the soup to a boil, then reduce it to simmer. Season the soup with salt and pepper only when the lentil is cooked through. پیاز را در روغن سرخ کنید تا طلائی رنگ شود. عدس را با 6 تا 7 پیمانه آب اضافه کنید و آب را به جوش بیاورید، سپس در قابلمه را بگذارید و درجه را کم کنید تا آب کم کم بجوشد. Dear Leilee. This is Soraya, remember? old friend from Saari! Now I am in Mashad. I was very surprised when I visited your site. I am interested in cooking and baking so much! Anyway your blog is really fantastic. and I am sure it takes a lot of time, since you write both in persian and English. 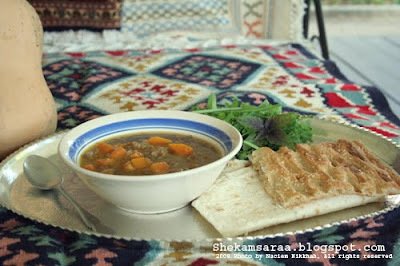 By the way, There is a good site for cooking and baking in persian : www.mamisite.com which I am a member of . I think you will find it interesting. Take care and kiss your beautuful mother and sisters from me. Hi Soraya joon. Off-course I remember you. Thank you so much for the website. I didn't know if the website before, but it looks interesting.